AP EAMCET 2017 Results – Manabadi EAMCET Engineering, Bi.P.C Result, Rank Card Download @ sche.ap.gov.in: AP EAMCET 2017 Results, RankCards, AP EAMCET 2017 Engineering and Medical Exam Results. Engineering, Agriculture and Medical Common Entrance Test (EAMCET) is conducted by Jawaharlal Nehru Technological University Kakinada on behalf of APSCHE. This examination is the prerequisite for admission into various professional courses offered in University/ Private Colleges in the state of Andhra Pradesh. The exams are conducted in the month of May, and the Andhra Pradesh EAMCET Results 2017 or AP EAMCET Result 2017 to be out on 5th May 2017, after the results are announced, the students can also take the print out for temporary use, and very soon the official rank card or the score sheet will be released on official website http://sche.ap.gov.in , the students can check results on various sites which host results like manabadi, schools9, India results, Bharath-students and many more, they can keep their rank cards with them as it is useful for their further usage. JNTU, Kakinada issued the AP EAMCET 2017 Notification in February 2017 and the JNT University invited the Online Applications from the Eligible students for admission into various engineering medicine and agricultural courses through EAMCET 2017 from 09-02-2017 to 17-03-2017. Applied students were downloaded their hall tickets from 19-04-2017 and they were appeared the entrance test from 24-04-2017 to 28-04-2017. Check the AP EAMCET 2017 Result online or AP EAMCET Result 2017 from http://sche.ap.gov.in/EAMCET/Eamcet/EAMCET_HomePage.aspx ,, Manabadi, schools9, Candidates can check their results name wise or college wise or even rank wise results will be available at official web portal after announcement of results on May 5th. Jawaharlal Nehru Technological University Kakinada (JNTUK) is making arrangements for the release of the results of the AP EAMCET-2017 at 5 p.m. on May 5. The ranks would be sent to the registered mobile phone numbers of the students in the form of SMS within half an hour of the declaration of the results. He thanked all the officials who extended their support to the university in conducting the test in a peaceful manner. The Candidates who were appeared for this stream, they are waiting for their results. The JNTU Officials will announce the results of eamcet. So, candidates can check their results from the official website only. 2. 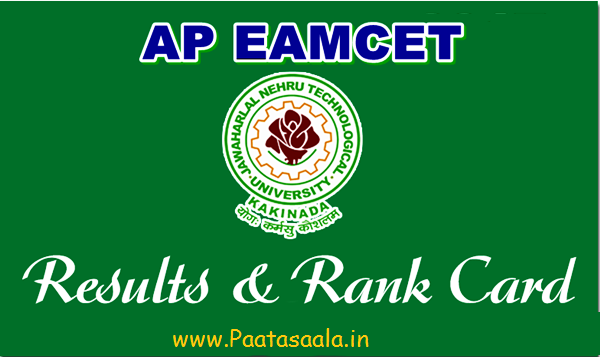 Click on the “AP Eamcet 2017 Results”. 4. Results will be displayed on your screen along with your details. 5. These are details may be available to you like Hall Ticket No, Stream, Registration No, Candidate’s Name, Father’s Name, Gender, Category, Local Area, Combined Score, Eamcet Weightage, Inter Weightage, Eamcet Marks Candidates Scored, Maths Physics etc, Group Total, Group Maximum, Intermediate Percentage, Rank, Approx. Local Rank (Local Area + Category), Result. 6. You can take the print out or download it for further usage. AP EAMET 2017 Results are released Amaravathi: Andhra Pradesh EAMCET -2017 results were released. Ministers Banca Srinivasa Rao, Kamineni Srinivas and Somireddy Chandramohan Reddy were released in Vijayawada on Friday afternoon, with the results of EAMCET Engineering, Agriculture and Pharmacy. Ranks and marks will be sent to students' mobile phones. Ministers said the rank cards could be downloaded from the website on 12th of this month. Tags: AP EAMCET 2017 Results, Manabadi EAMCET Result, Rank Card Download , AP EAMCET Results official website sche.ap.gov.in, Download AP EAMCET Result, Score Card, JNTUK EAMCET Results, AP EAMCET (Engineering, Agriculture and Medical Common Entrance Test) in the state of AP, Andhra Pradesh State Council for Higher Education (APCHE) EAMCET examination Results , Engineering / Medical/ Agriculture examinations EAMCET examination can get admission into Professional Dgree courses such as B.Tech/ B.Pharm, MBBS Results 2017.